Band of expected size (22.5 kDa observed. Less prominent band corresponding to mono- ubiquitylated form may also be observed at around 30 kDa in some instances. Please note that longer exposures may reveal non-specific band at around 80 kDa. 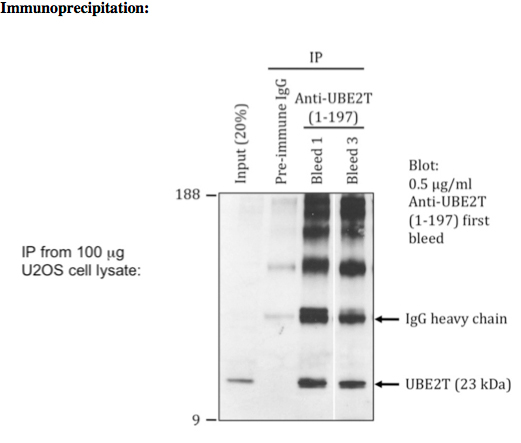 20 ug of antibody non-covalently coupled to Protein G-Sepharose successfully immunoprecipitated endogenous UBE2T from 100 ug of cell lysate.